MDA National Goodwill Ambassador makes second national TV appearance as show announcer. 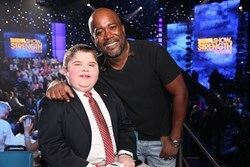 Country star Darius Rucker poses with Bryson at his 'announcers post' during the 2013 MDA Show of Strength Telethon taping on Aug. 1. "Bryson's positive attitude and quick-witted personality immediately capture the attention of everyone he meets, and we are honored that he will be a part of the broadcast again this year," said MDA President and CEO Steven M. Derks. 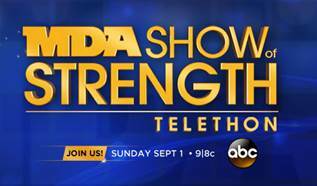 Bryson Foster of Concord, N.C., is set to open the 48th annual MDA Show of Strength Telethon this Labor Day weekend, Sunday, Sept. 1, 9/8c, on ABC television stations across the country. He will introduce some of the show's biggest acts, including Grammy Award-winning pop sensation Backstreet Boys and teen pop star Austin Mahone. Bryson makes several additional appearances throughout the show alongside co-announcer Shawn Parr doing segment introductions and national partner recognitions. "Bryson's positive attitude and quick-witted personality immediately capture the attention of everyone he meets, and we are honored that he will be a part of the broadcast again this year," said MDA President and CEO Steven M. Derks. "Bryson's enthusiasm is contagious, and he understands the importance of his role as National Goodwill Ambassador in spreading MDA's mission of help and hope to the American public. We're very lucky to have a shining star like him to represent the individuals and families we serve." Bryson is MDA’s 2013 National Goodwill Ambassador, and as part of his role, he travels throughout the country (along with parents, Claire and Phil) speaking to groups about MDA’s research and lifesaving mission. Bryson is affected by Duchenne muscular dystrophy (DMD), a disease characterized by muscle weakness in the hips, legs and shoulders. It involves progressive degeneration of voluntary and cardiac muscles; weakened cardiac and respiratory muscles severely limit life span. Since becoming MDA’s Goodwill Ambassador in 2012, he has traveled all over the country as the face and voice of MDA. When he's not busy on MDA's behalf, Bryson is enthusiastic about his seventh-grade classes, and enjoys playing with his friends and singing karaoke. Bryson is a self-proclaimed sports fanatic, and his ultimate dream is to become a quarterback for the Cincinnati Bengals, a head coach or sports announcer — in that order. The 2013 telethon will feature a star-studded celebrity lineup, including: Ryan Seacrest; Backstreet Boys; country stars Luke Bryan, Darius Rucker and Lee Ann Womack; "Glee" star Matthew Morrison; Enrique Iglesias; Paula Abdul; teenage pop sensation Austin Mahone; hip-hop dance crew Jabbawockeez; "American Idol" runner-up Jessica Sanchez; Kenny Loggins with the Blue Sky Riders; American blues rock band Vintage Trouble; and Universal recording artist and star from “The Voice” Chris Mann. Additional presenters for the 2013 show include: ABC's Dr. Richard Besser; "Dancing with the Stars" contestant and "Brady Bunch" mom Florence Henderson; Emmy award-winning journalist Jann Carl; Olympic gold medal gymnasts Nadia Comaneci and Bart Conner; and No Doubt drummer Adrian Young and his son Mason Young. As in the past, the entertainment event will raise funds and awareness to support MDA’s mission to help children and adults affected by progressive and often fatal muscle diseases. While the telethon has consistently enjoyed robust support from some of the biggest celebrities in show business, the real stars on the telethon are the individuals and families served by MDA, including six families who will share their stories of survival and hope during the 2013 broadcast. The MDA telethon is one of America’s longest-standing and beloved fundraising and entertainment events. For 48 years, funds raised by MDA telethons also have contributed to the organization’s worldwide research program. Today, through current clinical trials, there is growing excitement that new lifesaving treatments and discoveries are on the horizon for many of the disorders MDA is dedicated to defeating, including Duchenne muscular dystrophy (DMD), spinal muscular atrophy (SMA) and amyotrophic lateral sclerosis (ALS). MDA’s first Labor Day weekend telethon was broadcast in 1966 on a single New York station and has become the most successful fundraising event in the history of television. The show, with Jerry Lewis as its iconic host through 2010, and with help from a legion of top celebrities and entertainers, has raised millions each year to provide life-enhancing support and services for the families MDA serves. Visit mda.org/muscle to learn more about the 2013 MDA telethon. The Muscular Dystrophy Association is the world’s leading nonprofit health agency dedicated to finding treatments and cures for muscular dystrophy, amyotrophic lateral sclerosis (ALS) and other neuromuscular diseases. It does so by funding worldwide research; by providing comprehensive health care services and support to MDA families nationwide; and by rallying communities to fight back through advocacy, fundraising and local engagement. Visit mda.org and follow us at facebook.com/MDAnational and @MDAnews.